A (relatively) large infrared metamaterial, up to 4 mm x 4 square mm in size, that is essentially isotropic (works in all directions) has been developed by a team of scientists from RIKEN in Japan and NARLabs in Taiwan, using a type of metamaterial element called a split-ring resonator (SRR). 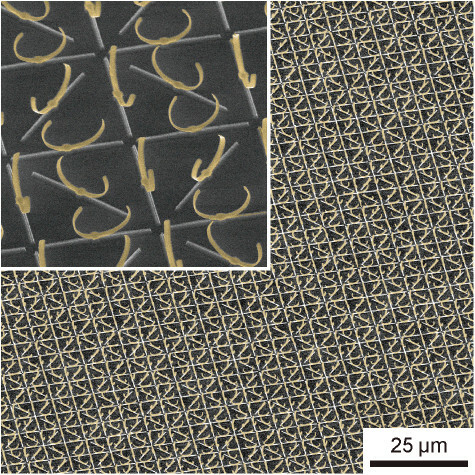 Metamaterials developed so far have been two-dimensional and inherently anisotropic, meaning that they are designed to act only in a certain direction. Published in Advanced Optical Materials, scientists have been able to manufacture three-dimensional isotropic metamaterials, but up to now, only on a very small scale. The researchers began with a top-down process. They deposited a layer of PMMA, a polymer, on a substrate of silicon. 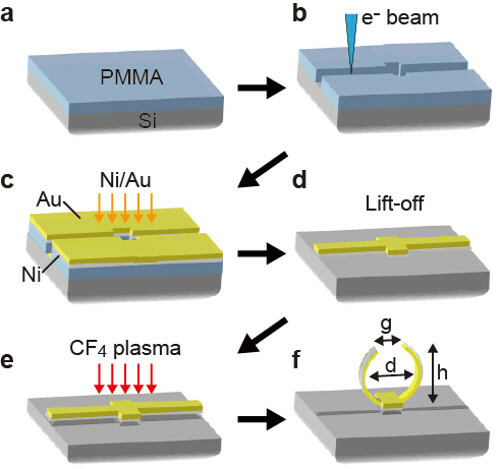 They then used electron beam lithography to etch a ribbon-shaped ditch in the polymer, and then deposited a metallic strip made of nickel and gold. Following this, the used a bottom-up process. They removed all of the metal film outside of the ditch and eliminated the silicon except for a small button in the center ribbon of the strip, and when the chip was exposed to air, the stresses on the metal strips led them to form upward into a ring, creating a three-dimensional metamaterial resonator. Essentially, the tension within the materials themselves was used to cause them to fold. The team then used spectroscopy to find that the materially was unambiguously and remarkably isotropic when rotated in any direction up to an incident angle of 40 degrees. These optical properties of the SRR were also supported by three-dimensional electromagnetic numerical calculations. For example, the new method could lead to “superlenses” that would allow for cloaking devices and for going beyond the diffraction limit of conventional lenses, the researchers say.